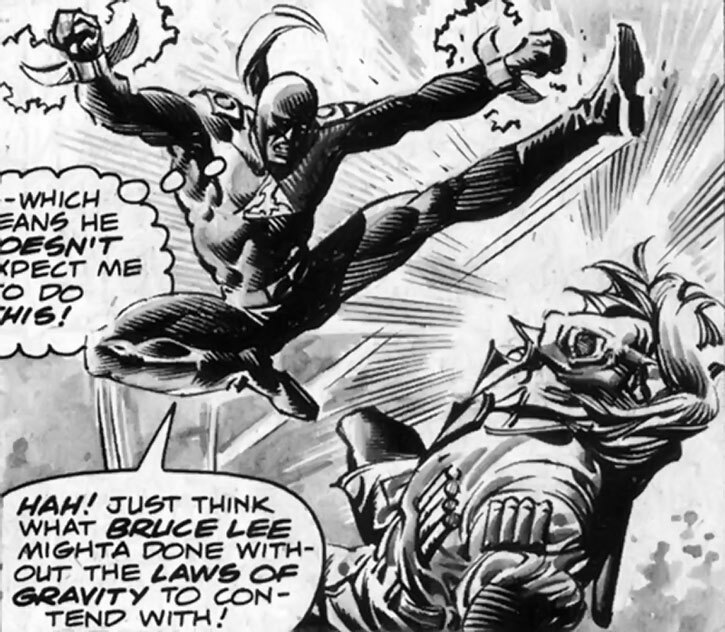 Killer Shrike is a Marvel Comics jobber who was introduced in 1977. He had the building blocks to be cool, but he was hit pretty hard by super-villain decay . Still, there are some good stories left in this failed warhorse. Group Affiliation: Former member of the Air Force (the mercenary group, not the USAF or any other military’s air force), former employee of such agencies as the Roxxon Oil Company, the Conspiracy (specifically Ulluxy’l Kwan Tae Syn), the Thunderbolts Army, and the Master of the World. Height: 6’5” Weight: 250 lbs. On paper, Maddicks is a redoubtable opponent. He’s a big, powerful guy with extensive martial arts training and experience, a military background, and obviously accustomed to deadly violence. His speed, strength and reflexes have been artificially enhanced. 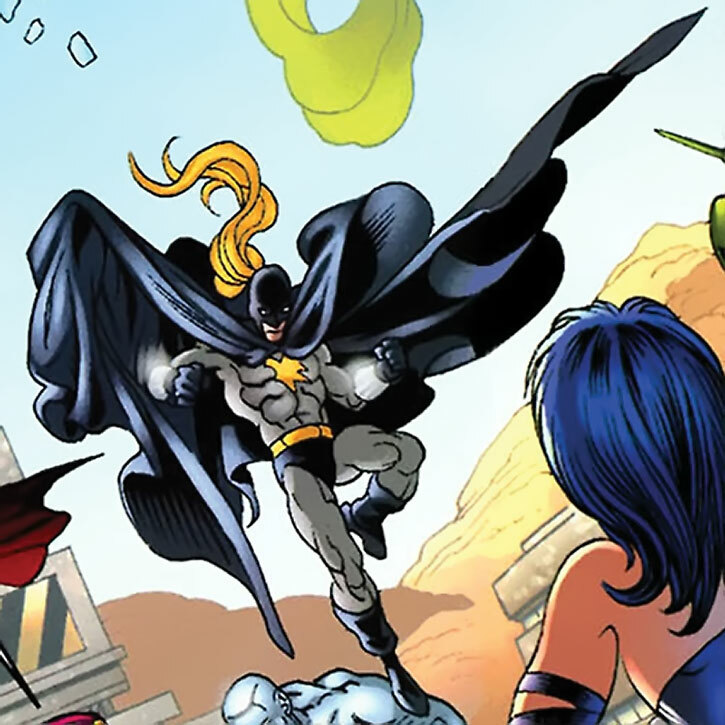 Furthermore, he has an anti-gravity implant at the base of his spine, allowing him to fly at 80mph (about 130 km/h). 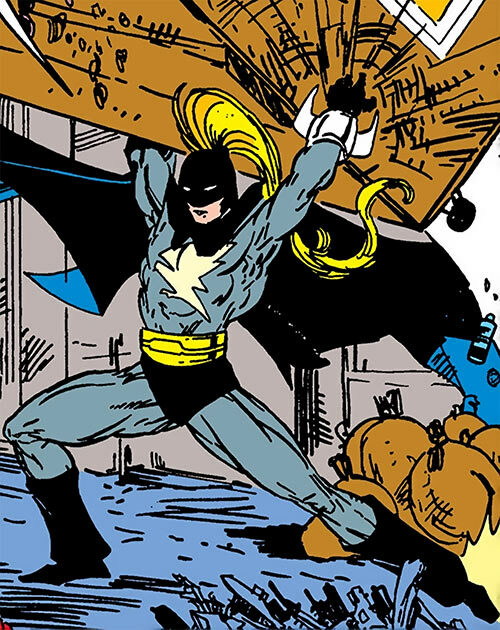 From the primary sources, it would seem that while Maddicks has minor superhuman strength of his own, the bulk of his superhuman strength comes from later versions of his special suit. With the suit on, Killer Shrike can pick up a two-ton police cruiser or a garbage-filled city dumpster and throw it about ten meters. He can rip engine blocks out of cars without significant effort, but he’s not as strong as Spider-Man. His equipment further include full-body, insulated lightweight body armour (proofed against small arms) and a pair of weaponised bracers. 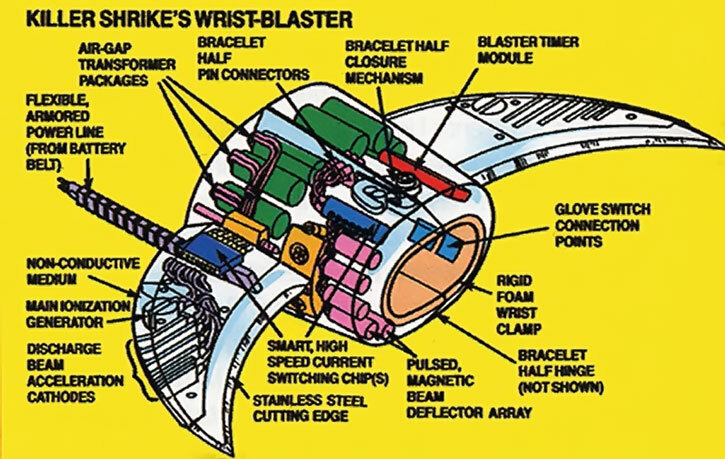 These bracers combine sharp, half-crescent-shaped steel blades with short-ranged electrical blasters reportedly emitting 50,000 volts. Apparently, the blades can be retracted into the bracers. It is possible to electrify the blades before striking. Though his wrist-mounted talon blades are short, Killer Shrike excels at using those in slashing fly-by attacks, and can do so without a serious risk of a crash or collision. Early models had a flaw – if they were slammed together, the wielder would be electrocuted. In practice, Maddicks just can’t cut it on the tremendously demanding superhuman scene. He’s an unlucky guy, and in game terms has few Hero Points that he doesn’t manage well. His morale has gotten wobbly due to the numerous defeats he suffered, and his mental endurance has always been poor. However, one should keep in mind that this poor performance is because Maddicks keeps running into skilled, superhumanly powerful heroes. Against street-level opponents and on a good day, Killer Shrike can be genuinely dangerous. Early on, Maddicks demonstrated a good trick. He assisted jumping kicks with his power of flight, thus delivering these much faster than expected and under normally impossible angles. In DC Heroes terms, this is best used to explain a double on a melee attack roll (or a successful HP spending on AV and/or EV). Maddicks mentioned that he repaired and improved his talons himself, so he likely has at least basic hardware skills – maybe he studied as an electrician. After leaving the military, Simon Maddicks became a soldier of fortune. He was eventually recruited by the Brand Corporation (a Roxxon Oil company) to serve as a test subject. He went on to become an early success for the Brand researchers. The enhancements and implants were stable, and aside from a few quirks the armour and weapons worked fine. In 1977 he was working for Ulluxy’l Kwan Tae Syn, who told Maddicks that he was working for the Conspiracy and sent him to run surveillance on Bloodstone Island. Maddicks witnessed the giant monster Goram attacking the island, and Ulysses Bloodstone defeating it. Killer Shrike swept in and freed the bound monster, but Bloodstone forced Maddicks to the ground and defeated him. Badly electrocuted, Killer Shrike was evacuated to the US in a fast boat. He was hospitalised in New York City, without anybody knowing whom he was and what was his story. Though his physical wounds healed, he remained in a coma, apparently because he was traumatised by this defeat during his baptism of fire. The Conspiracy sent the Modular Man and an unidentified person called Jocko, who stole Maddicks from the hospital. However, during this operation, Ulluxy’l Kwan Tae Syn and the Conspiracy were destroyed. The Modular Man revived Maddicks, but his patient was left with partial amnesia. Exploiting this, the Modular Man had Killer Shrike join him in stealing an experimental device, telling Maddicks that it could heal his amnesia. 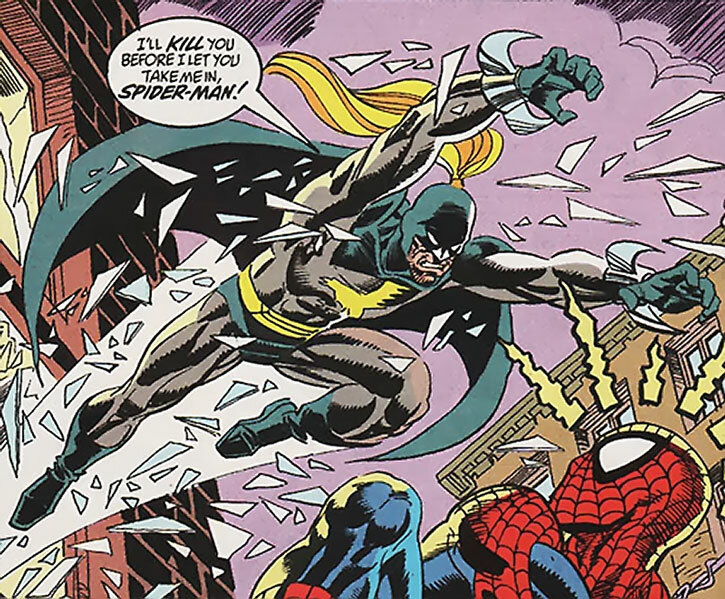 Despite the opposition of Spider-Man and the Beast, the two villains were successful. But the Modular Man then discarded the Killer Shrike as he used the device to immensely increase his power. Maddicks fled while the two heroes defeated his erstwhile accomplice. As “Harold Simmons”, Maddicks resumed working for the Brand Corporation. He served as a bodyguard for CEO James Melvin. According to secondary sources, it was Brand who fixed Maddicks’s amnesia. During a society bash, the armour under the bodyguard’s suit was taken over by a ball of light. Physically controlled like a puppet, Maddicks kidnapped reputed scientist Marla Madison and flew her to a secret Brand lab. There, the Will O’ The Wisp revealed that he had been controlling the Killer Shrike’s armour, and wanted Madison to fix his medical condition. Killer Shrike ended up knocked out by Spider-Man, but Madison was successful. This incident contributed to exposing Brand’s illegal activities. The company was eventually shut down, depriving Maddicks of his benefactors and employers. In 1983, Killer Shrike was captured by the West Coast villain Locksmith. But he and the numerous other superhuman captives were freed by Spider-Woman. Two years later he was back in New York, robbing some banks while he sought a good mercenary contract. 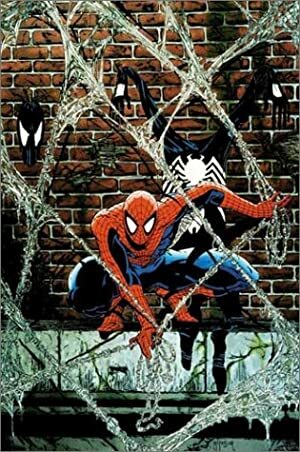 Paranoid and jumpy, he savagely attacked Spider-Man as he was coincidentally swinging by, and was defeated. It was presumably during this general era that Maddicks earned the enmity of mob boss Hammerhead in unknown circumstances. During the first Secret Wars, Killer Shrike joined the numerous minor super-villains who filled the vacuum in New York City after the big-name heroes and villains disappeared. However, the NYPD and a host of minor super-heroes eventually defeated them. To have a fighting chance against major super-heroes, Killer Shrike contracted the Tinkerer to build a booster for his equipment and implants. 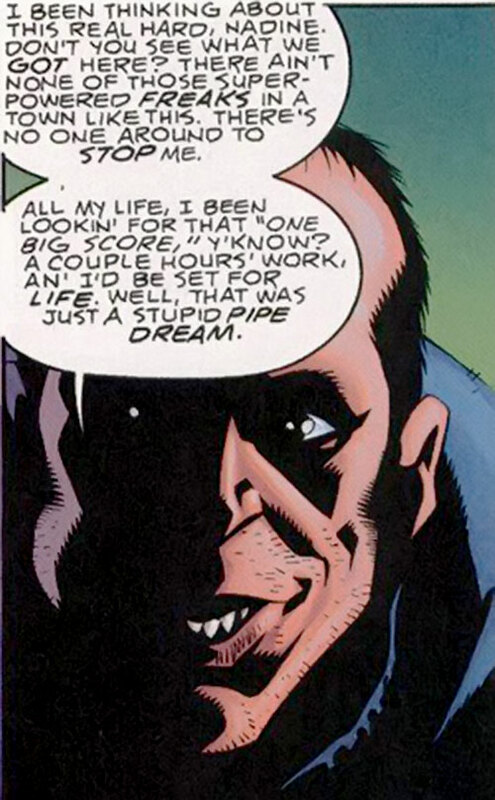 Spider-Man intervened during the delivery, and Maddicks forced the Tinkerer to give him the device. However, the Tinkerer had anticipated treachery, and all that the module did was knock Killer Shrike out for the cops to arrest. 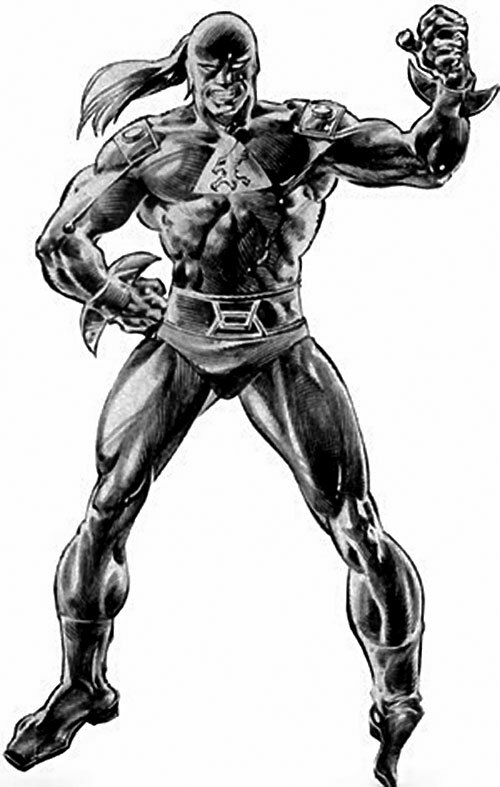 Killer Shrike was among the mercs hired during the 1990s Acts of Vengeance conspiracy to fight opponents unused to them. He was assigned a sector of New York City to rampage in, and soon allied with fellow hires Coachwhip and Ringer II. As their paymasters had hoped, they ran into Moon Knight. Though Ringer II was a joke, the other two were more than Moon Knight could handle. The Knight’s pilot Jean-Paul Duchamp strafed the Shrike to save his employer, but was downed by return fire and grievously wounded in the crash. However, friendly fire from a dazed Ringer forced Maddicks to retreat before he could finish off his opponents. 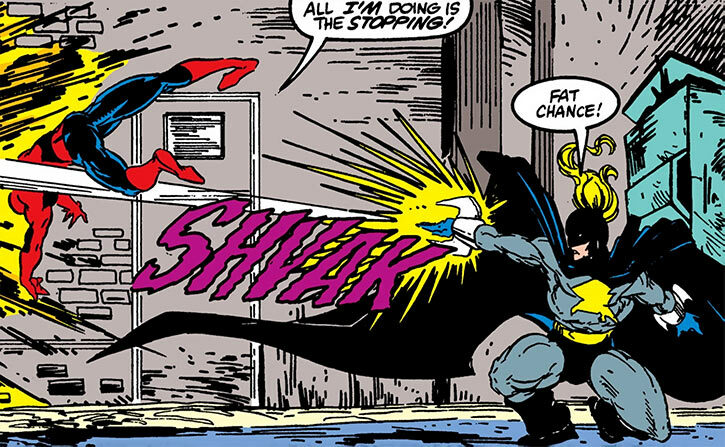 The Killer Shrike and the Grey Gargoyle were later given a device to control the Dragon Man and sent to murder a rogue mobster, but were defeated by the She-Hulk and Surge. Maddicks’ next plot went better, as he obtained a lot of money by robbing casinos in Atlantic City. His loot rose higher still after he focused as one casino, whose owner was implicated in shady deals preventing him from calling the police. However, Jean-Paul Duchamp had been keeping feelers out for the man who had nearly crippled him, and had developed specialised tactics and weaponry. The Frenchman confronted and narrowly defeated Killer Shrike then sent him to prison. After getting out, Killer Shrike made inquiries about the 1400 Club, an assassins’ guild he presumably intended to join. However, he became paranoid and convinced himself that they were out to get him. His anxiety once again led him to attack Spider-Man as the hero just happened to pass by, and after a good start Maddicks was soon defeated. In ‘93, Killer Shrike joined the Air Force, a mercenary teamed composed of Cardinal, Sparrow and Tanager. 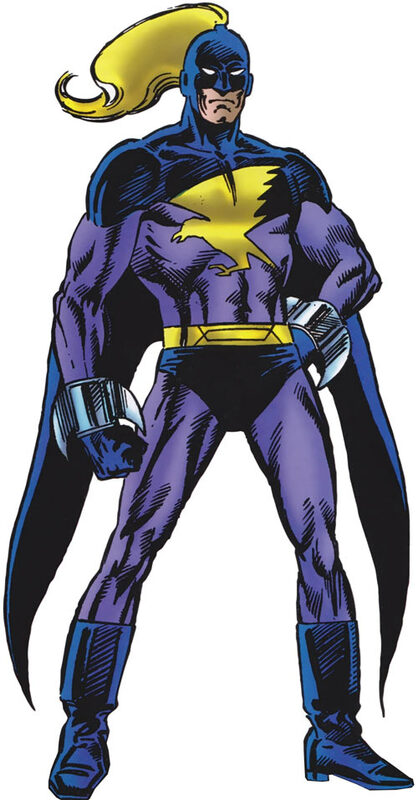 The four flying ex-soldiers were sent after Turbo (Mike Jeffries) of the New Warriors. They fought well, but were taken down by the more powerful Nova and Michiko Musashi. 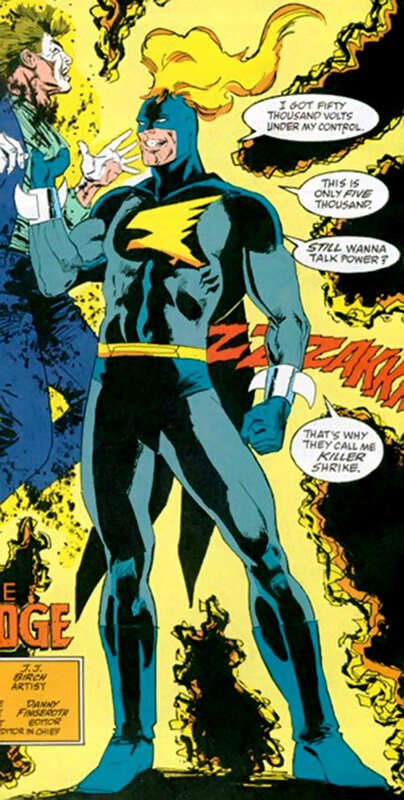 Further appearances by Killer Shrike with the Air Force are believed to be a continuity mistake, as they replaced him with Oriole. It was presumably in prison that the Killer Shrike was given a much less glamorous contract. The job was to shut down the dojo operated by the Sons of the Tiger to stop them from interfering with local criminals. Furthermore, it went bad as the Sons were joined by the Prowler, who forced Killer Shrike to the ground where he was defeated. Killer Shrike later entered the fighting tournament set by the Architect, but was thrashed by Shatterhead. After this long series of defeats, Maddicks finally gave in to the pressure of his girlfriend Nadine. He pretended to retire from super-villainy. They drove westward in his beat-up van, but Killer Shrike’s plan was to rob small towns without super-heroes. In Wausan, WI he somehow managed to run into the Hulk – and, again, lashed out in paranoid anger. The Hulk mostly ignored him, but the collateral damage collapsed a building on Maddicks’ van, apparently killing Nadine. In 2004 Shrike was back in New York City. True to form a random bank robbery of his attracted the attention of Avengers, vastly overpowering him. S.H.I.E.L.D. requested that he be handed over to them. 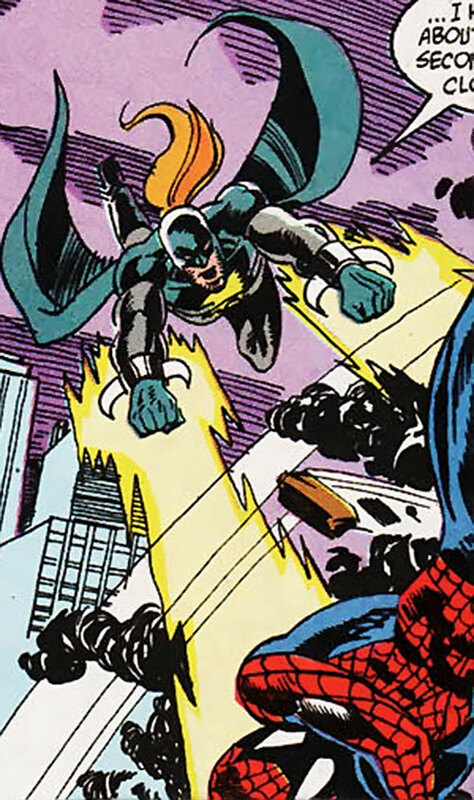 S.H.I.E.L.D.’s Jimmy Woo and Jasper Sitwell had been investigating a new source financing loser villains such as Killer Shrike. Furthermore they knew that Maddicks was psychologically weak and likely to talk. The two excellent interrogators soon had Killer Shrike lead them to his contact, the Tinkerer. However the Tinkerer realised that something was wrong and his security systems electrocuted Killer Shrike. Albeit the S.H.I.E.L.D. agent on the scene thought that Maddicks was dead, the mercenary narrowly survived. After recovering, Killer Shrike raided the old Brand Corporation lab where he had been enhanced. One presumes that his goal was to steal spare parts now that his connection with the Tinkerer was gone. Though he picked the Christmas break to attack as he knew that security would be at its weakest, his awful luck struck again and he was defeated by the Grasshopper. 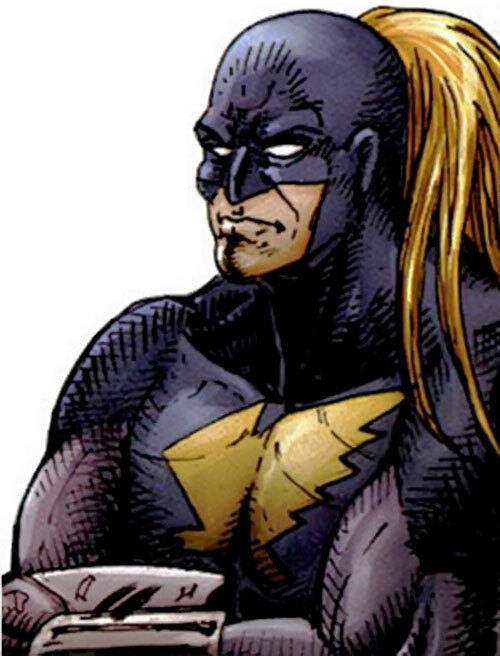 A few months later, in 2006, Maddicks was freed to join the Thunderbolts Army. 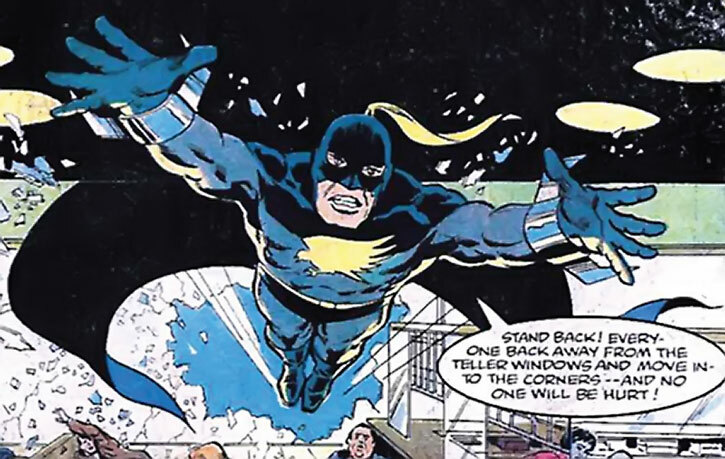 During the Universal Wellspring crisis, he was sent to Sydney along with other villains (Aqueduct, Slyde, a man who may have been the Ox, and others) to control a crazed mob of newly-empowered civilians. The team was eventually overwhelmed, but the Thunderbolts soon cut off the Wellspring. In 2008 Roxxon rehired Killer Shrike. They sent him to the Savage Land to back yet another of their attempts to appropriate its natural resources. He and a Roxxon fire team massacred a primitive village to gain access to Antarctic Vibranium . They were attacked in return by Ka-Zar – who killed the soldiers and left Maddicks alive to bring a message back to his masters. To retaliate, Roxxon sent Killer Shrike, the current Saboteur, the Manticore, several Mandroid armours and other heavy firepower after Ka-Zar and Shanna. They underestimated their primitive opponents, who mustered an army — with the Devil Dinosaur on point — and used Vibranium ore. Killer Shrike managed to flee. Roxxon made another attempt after hiring Ka-Zar’s brother the Plunderer, who vibranium-proofed two mechas. This went much better and the Savage Land armies were routed, with Killer Shrike shooting Ka-Zar in the back before he could rally his dinosaurs, men, mutants and others. However, the lord of the Savage Land escaped and struck back using Stegron’s technology. Roxxon forces were defeated for the third time and gave up. Killer Shrike returned to a skid row in New York City, doing small Bar With No Name jobs to pay for prostitutes. Moon Knight learned of his presence, and leapt to the conclusion that he was after Jean-Paul Duchamp. The unstable Moon Knight ambushed and thrashed Killer Shrike, who only survived thanks to his superhuman constitution. Killer Shrike was one of the costumed mercenaries indirectly employed by Doctor Doom to facilitate his indirect takeover of Wakanda and appropriation of Vibranium. 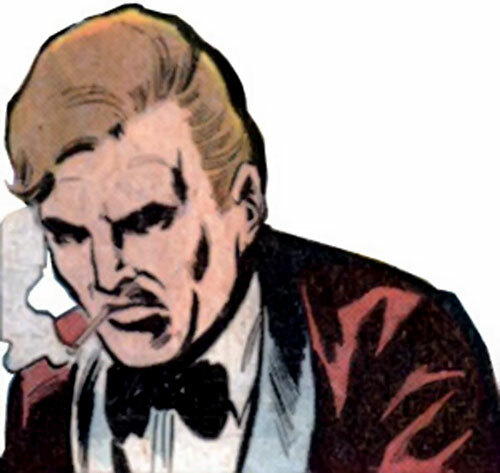 He was recruited by Doom’s ally the Broker — Walter Declun, the former CEO of Damage Control — to keep the Black Panther, Namor and the Fantastic Four busy. This delaying action was successful. Declun had issued new costumes and power upgrades to his squad, but the Killer Shrike wasn’t seen fighting and any new or enhanced powers are undocumented. 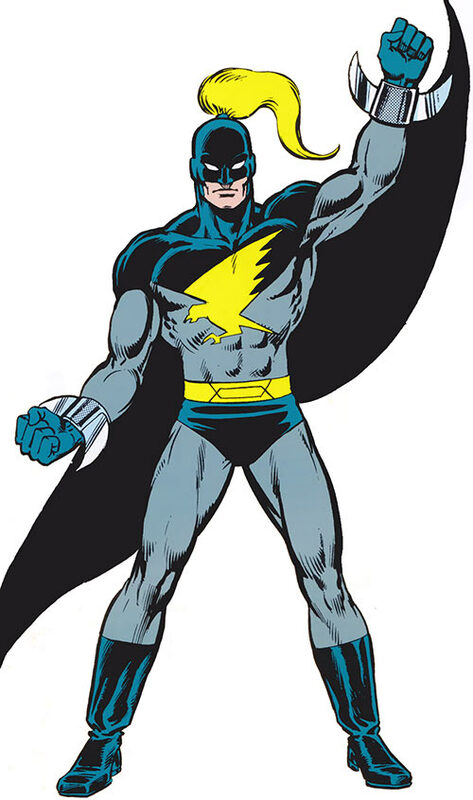 In 2012, Killer Shrike was among the hundreds of costumed criminals who moved to Bagalia to work for Max Fury and the Shadow Council – and was back to his old costume. He was among the throngs possessed by the Abyss until the Secret Avengers broke the effect, and was still living in Bagalia in 2013. 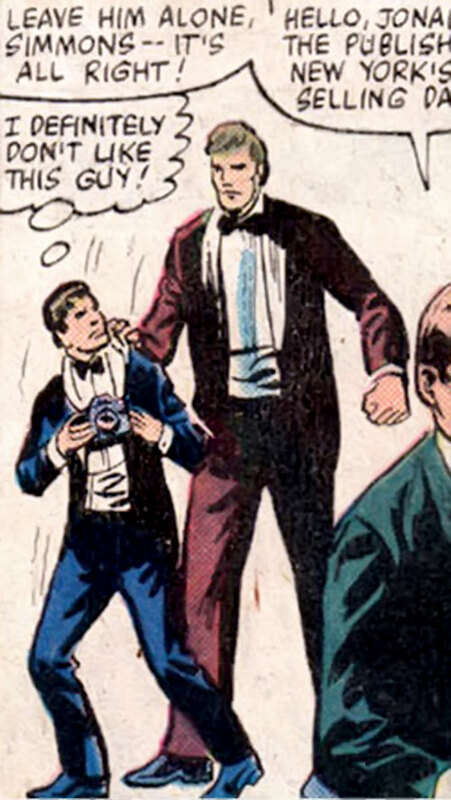 Maddicks was drawn as a very tall and broad man in an early Spider-Man appearance, hence the official height and weight. In practice though, he’s not usually drawn as being that big – closer to 6’1”. Shrike has gotten noticeably older and more squalid-looking over the years, with unkept male-pattern baldness and lax shaving habits. He’s a smoker. Killer Shrike is your basic thug and bully. He’s confident and superior against those weaker than himself but very wary of superhuman opponents unless he has allies. He has a paranoid streak and isn’t a friend of subtlety. If he can see his foes he will sweep in with blades out, if not he’ll blast through obstacles then engage them. Killer Shrike prefers to fight in the air, especially against non-flyers. Maddicks hates dealing with paperwork, after-action reports and the like. This damages his professional cred. Generally speaking, he’s a loser with horrible luck, and nothing he does ever works. This may explain his paranoia issues – on several occasions he became certain that he was being hunted down by heroes and/or assassins and lashed out. He might suffer from chronic depression, especially since his life has just been spiralling down for years and he gradually lost everything. It has been noted that he’s always been aimless. Shrike can be used as just a thug and merc — or as a guy who’s just trying to get rich with his sole skill set, but is crushed by sheer bad luck and personal limitations. 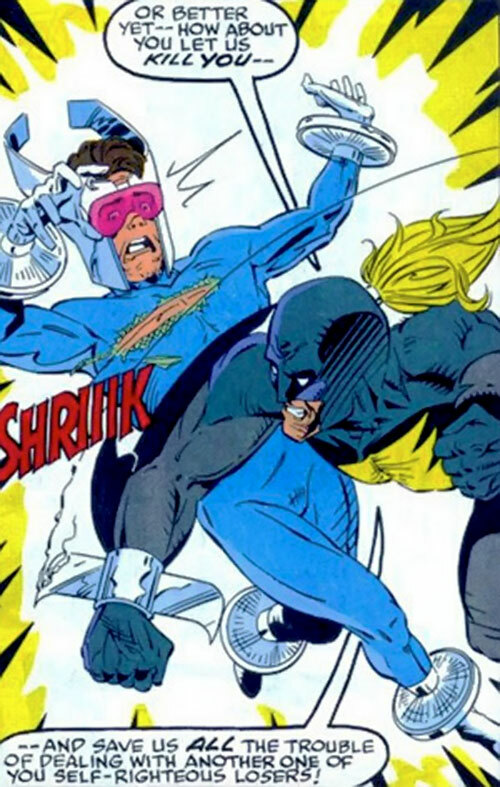 Killer Shrike would have been enhanced by the defunct organization known as The 1,000, and fought Mindancer and Booster Gold a few times. Or he could be an early success of the Society of the Golden Wing, as seen in the 1990s Black Condor series. Or the implant in his spine might be Ninth (Nth?) metal. 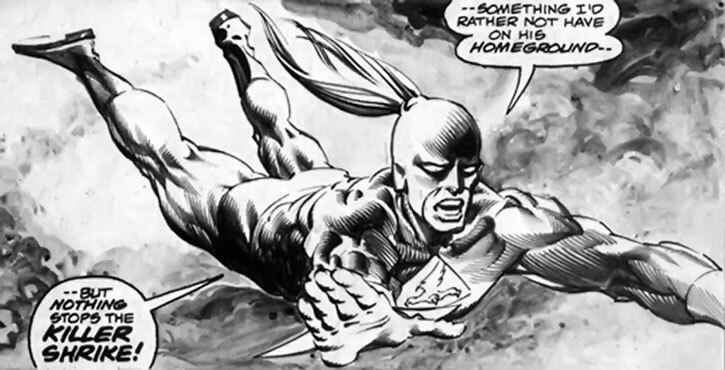 He might have been a human agent of Thanagar sent to kill the spy Hawkman when it was feared that he had gone native. Or he could have started out as a primary opponent of Hawk and Dove and then been hired by a Gotham mob boss for a time ending with defeat at the hands of Batman. Having rebuilt his rep he can now be a recurring foe of the Hawkpeople. Alternatively, he could be an enemy of the Blackhawks, after the War. 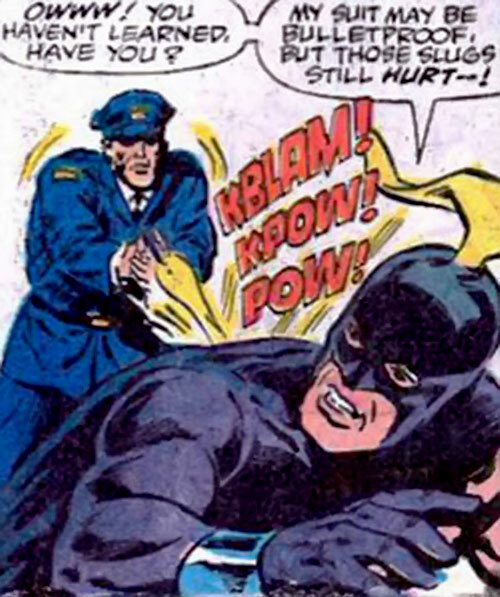 Or maybe it’s just “Killer Shrike” sounds a lot like Blackhawk’s archenemy’s name, “Killer Shark”. Expertise (Killer Shrike equipment), Familiarity (Military equipment and protocols). Public ID (though an obscure one), Unluck. BODY ARMOUR [/STR/ 08 BODY 08, Invulnerability: 08, Lightning Immunity: 03, Skin armour: 02, Limitations: Skin Armour only vs. blades and bullets ; Invulnerability only vs. electrical damage ; /STR/ likely can’t enhance the wearer by more than 2 APs, Drawback: Real Armour]. 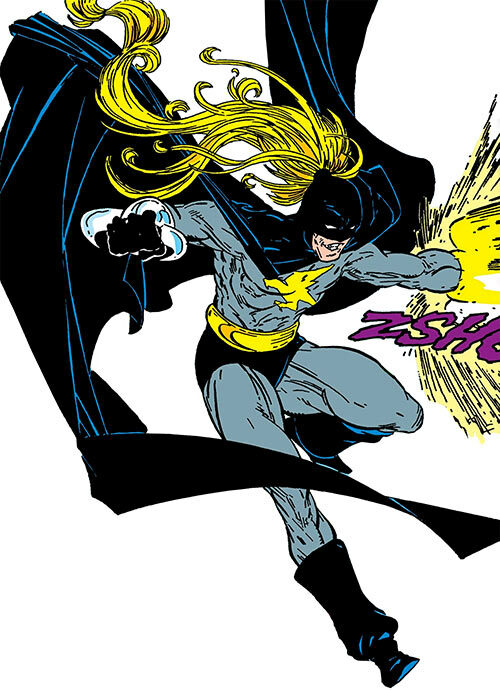 The first version of the costume didn’t seem to be powered and thus lacked the /STR/ ; the first powered version was probably the one the Will O’Wisp took control of. TALONS [BODY 12, EV 03 (07 or 09 w/STR), Lightning (Diminishing): 09, Bonus: Lightning can be Combined with EV]. Early models had a flaw – if they were slammed together, the wearer would suffer a 10/10 AV/EV electrical shock, against which the armour couldn’t protect. Also note that the Lightning of the TALONS cannot inflict Killing Combat damage to a target that isn’t grounded. There are some inconsistencies as to his strength level, which have been solved with the “STR 06 + boost from later versions of the costume” explanation. This hypothesis matches well the observed performance of the character and is economical, but is not clearly supported by primary or secondary sources. – Augmented strength — Enhanced Strength 2, Enhanced Stamina 2, Enhanced Agility 2, Enhanced Fighting 3, Enhanced Fortitude 2, Close attack 1, Defensive Roll 2. – Anti-gravity implant — Flight 5. – Enhanced Strength 2 (Note – the first version of the armour didn’t have this). – Impervious Protection 2 (Limited 1 to Sharp Impact). – Protection 3, Enhanced Fortitude 4, Diehard, Ultimate Toughness (all are Limited 3 to Electricity). Steel blades — Strength-based Slashing Damage 1. Lightning emitter — Ranged Electrical Damage 9, Diminished Effect (-1 Damage rank per range increment), Diminished Range 3 (18/15/90 ft.). Electrified steel blades — Strength-based Slashing Damage 1 Linked w/Close Electrical Damage 9. Close attack 1, Defensive Roll 2 (4), Improved trip, Ranged attack 3. Athletics 2 (+7), Close combat (Unarmed, talons) 2 (+10), Expertise (Military) 4 (+6), Insight 1 (+1), Perception 3 (+3), Ranged combat (Firearms) 5 (+8), Ranged combat (Killer Shrike talons) 6 (+9), Technology 4 (+6), Vehicles 2 (+4) (Limited 2 to common land vehicles). Big Score Simon Maddicks is always after the “big score”. This usually leads to him going up against a superhuman opponent that far outclasses him. On File Simon Maddicks does have a public, though obscure, identity. 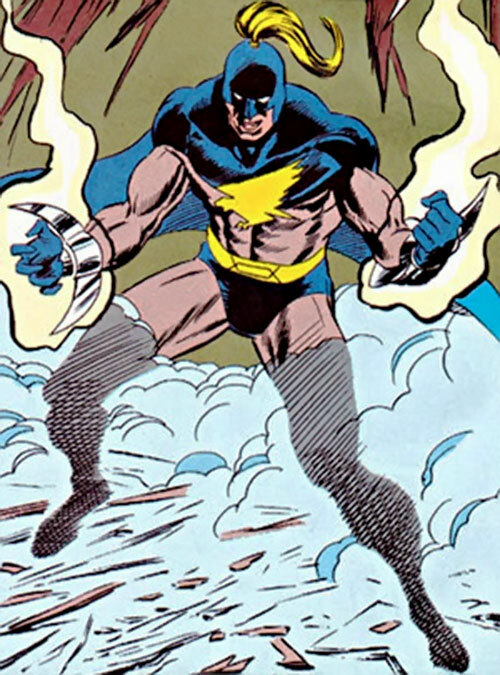 Design Flaw The older version of his electricity-generating wrist-talons could, when slammed together, send the electric current (Damage 10) into Killer Shrike and bypass his armour. Use the Disarm rules to attempt to bash them together. Panic Death Spiral If Maddicks feels overwhelmed and loses his confidence, doubt and rising panic diminish all his offense bonuses and his Will and Fortitude defences by a cumulative 1 per round. When his Will hits -5 he becomes Dazed by panic. This death spiral can be halted or even annulled if events restore his confidence. Trade-off areas Attack/Effect PL 10, Dodge/Toughness PL 10, Parry/Toughness PL 11, Fort/Will PL 5. Point total 106. Abilities 28, Defences 16, Skills 14, Powers 33, Devices 19, Advantages 6. Equiv. PL 8. NPCs do not have to gain Hero Points from Complications, but if you allow the Killer Shrike to do so he’ll blow it on some unwise stunt such as emulating Power Attack. It’ll probably miss, but if it doesn’t he might land a telling blow out of desperation. This profile mixes good stats (Killer Shrike is quite powerful against street-level opponents) with a lack of flexibility, half his Toughness in Defensive Roll and a mean Complication that combine to make him brittle when outgunned. Helper(s): DCU histories by Sean MacDonald, VBTusky and Jay Myers. Additional edits by Frank Murdock and Darci. Writeup completed on the 18th of December, 2009.